I will use what I know to create balance in the world around me. Understanding that sometimes, in order to be balanced with those I love, I need to step back and take care of myself. I strive to learn every day. I feed my logic brain lots of physiology, physics and nutritional facts and my gestalt brain with music, chocolate and art. 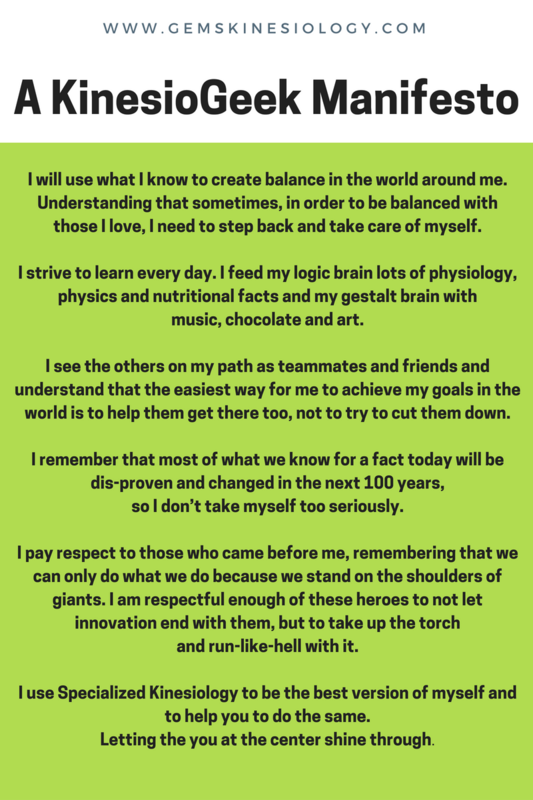 I see the others on my path as teammates and friends and understand that the easiest way for me to achieve my goals in the world is to help them get there too, not to try to cut them down. I remember that most of what we know for a fact today will be disproven and changed in the next 100 years, so I don’t take myself too seriously. I pay respect to those who came before me, remembering that we can only do what we do because we stand on the shoulders of giants. I am respectful enough of these heroes to not let innovation end with them, but to take up the torch and run-like-hell with it. I use Specialized Kinesiology to be the best version of myself and to help you to do the same. Letting the you at the center shine through. What do you think? What is missing that you would add? Instructor, practitioner, speaker and writer for Specialized Kinesiology. Homeschooling homesteading in the jungle. Mother of Dragons.